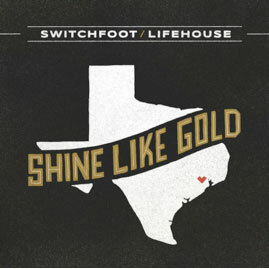 After the devastating storm that struck Texas, SWITCHFOOT and LIFEHOUSE wanted to do something together to give back and wrote a brand new song titled, "Shine Like Gold," which exclusively premiered on People.com. All proceeds from "Shine Like Gold" will be donated to aid Houston's recovery in partnership with Food for the Hungry. SWITCHFOOT and LIFEHOUSE are currently touring with each other for the first time ever on the "Looking For Summer" Tour. The bands will collectively be performing the song together at the Sept. 5 House of Blues show in Houston, Texas. Jon Foreman said, "Jason and I had always talked about writing a song together. When it finally happened, 'Shine Like Gold' became a song about everyday heroes fighting their way through the darkness toward the light. On the day we recorded the song, Hurricane Harvey began wreaking havoc in Texas. Sometimes you don't know what a song is for until after its written. In this case it became crystal clear. As we watched our friends and family in Texas struggle through the aftermath of the hurricane, we knew exactly what we had to do. We LOVE Houston. Houston is resilient and will rebuild. We're honored to be in Houston next Tuesday to bring hope and healing the best way we know how." On "Shine Like Gold" and the upcoming Houston show, LIFEHOUSE's Jason Wade said, "We can't imagine what everyone is going through right now in Houston, but they've all been in our thoughts and prayers. We look forward to playing this show, standing alongside this amazing city and doing everything in our power to help. Jon and I started writing "Shine Like Gold" at the beginning of this tour, but it wasn't until we recorded it in Nashville that we really knew what it was about. Seeing all of these amazing individuals who've sacrifice for their neighbors, and stepped up in the face of extreme hardship has been so inspiring. This song is for them. All of the proceeds from this song are going to Houston for the unsung heroes that do the right thing when no one is watching. All the love." Since their start, the band has sold over 5.7 million copies worldwide of their first nine studio albums (including their 2003 double-platinum breakthrough The Beautiful Letdown and 2009's Grammy Award-winning Hello Hurricane), racked up a string of Alternative radio hit singles, and performed sold-out world tours with over 4 million concert tickets worldwide. SWITCHFOOT released their latest album "Where The Light Shines Through," on July 8, 2016 via Vanguard Records.
" Where The Light Shines Through" is the band's tenth album and the first since 2014's highly acclaimed "Fading West." The album was self-produced in collaboration with John Fields, who helmed the multi-platinum breakthrough "The Beautiful Letdown." Beyond their career achievements, SWITCHFOOT has also been active in a variety of philanthropic efforts, raising over a million dollars to aid kids in their community through the band's own Bro-Am Foundation, a long-running annual benefit surf contest and concert that's held every summer in Encinitas, CA. One dollar of every ticket sale will be donated to SWITCHFOOT's BRO-AM Foundation providing services to underprivileged and disadvantaged youth. They've also maintained a deep commitment to a variety of humanitarian causes, lending their support to such worthy organizations as CURE International, DATA, the ONE Campaign, Habitat for Humanity, Invisible Children and To Write Love on Her Arms. Multi-platinum award-winning rock band LIFEHOUSE recently released their first hits compilation, LIFEHOUSE: Greatest Hits, on CD and all digital retailers. The 18-track selection will include a multitude of their chart-topping hits, including "You and Me," "First Time", "Halfway Gone," "Hurricane" and "Hanging by a Moment," which was the most played radio track of 2001. To mark the release, LIFEHOUSE, which includes Jason Wade (lead vocals, guitar), Bryce Soderberg (bass, vocals) and Ricky Woolstenhulme Jr. (drums, percussion), are co-headlining a U.S. tour with SWITCHFOOT, which will wrap Sept. 10 at the Masonic Auditorium in San Francisco after a show on Sept. 9 at the Greek Theater in Los Angeles (tour dates below). LIFEHOUSE was formed in Los Angeles by singer/songwriter/guitarist Jason Wade, bassist Bryce Soderberg and drummer Rick Woolstenhulme Jr. as Blyss in 1999, attracting the attention of producer Jude Cole. LIFEHOUSE's music has always been radio-friendly, but the band's success is as much for lead singer/guitarist Jason Wade's "sonorous" vocals and spiritual songwriting as it is for the band's well-honed cohesion as performers. Since 2000, LIFEHOUSE have released seven albums that have cumulatively sold 15 million around the world.